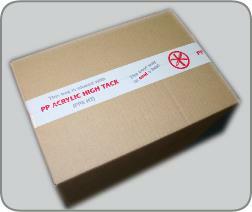 It is very suitable for basically any box, and has an excellent adhesive performance securing the box contens during heavy transport and rough handling. The products has both extra film thickness and adhesive thickness, and the total thickness is 65 my. the unwind noise can be kept at an acceptable level combined with a stabile and easy unwind tension. 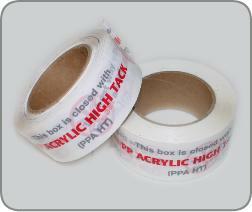 The product is available in white and clear backing for printed tapes, and clear and brown for unprinted tapes. Request a sample roll from our customer service. Silent unwinding (no noise), Topsurface printed (noisy). Excellent initial tack. Colors: Transparent, white and brown. Applications: Recommended for all kinds of boxes.